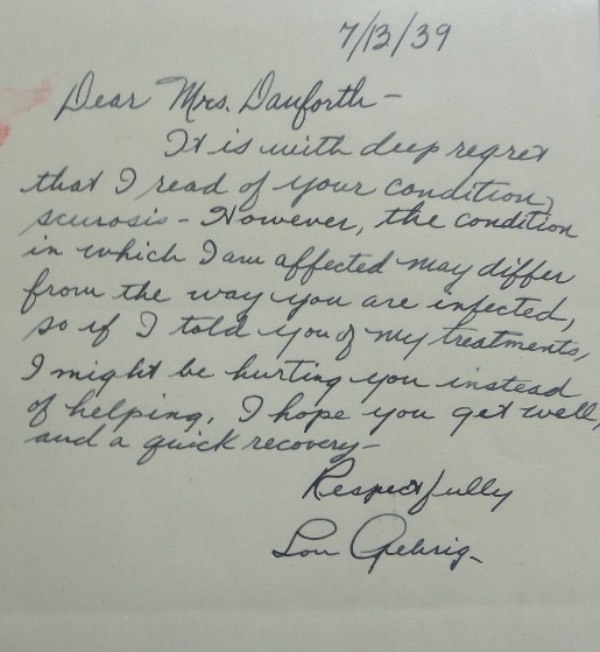 Coach's Corner - Lou Gehrig HAND-WRITTEN & SIGNED fan response letter from 1939! Go Back to Lot List Lou Gehrig HAND-WRITTEN & SIGNED fan response letter from 1939! This amazing piece of history is 7"x9" in size on white paper and dated by Lou from 7/13/39. It is to a fan discusses Lou's sickness and the fan's ailments and he wishes she get well soon. He has signed it superbly at the bottom! Comes with a COA from E.C.A. (East Coast Authenticators) for authenticity purposes. WOW!!! !